I often cook Italian or French food but very seldom (if all) Spanish food, although I love to eat it out. I don’t know why this is but here is my first proper attempt to change that. I did some research and then made my own version and although not perfect it was a good attempt. I used Rick Stein’s approach with par-boiling and frying the potatoes which was nice, but next time I will try them deep fried. 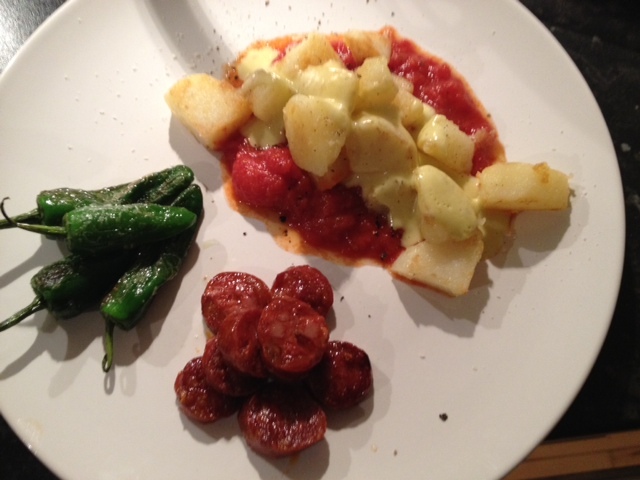 Although tasty, I thought it looked a little sparse to eat the patatas bravas on their own so I fried some chorizo and padron peppers to go with it, two things I can never have too much of. 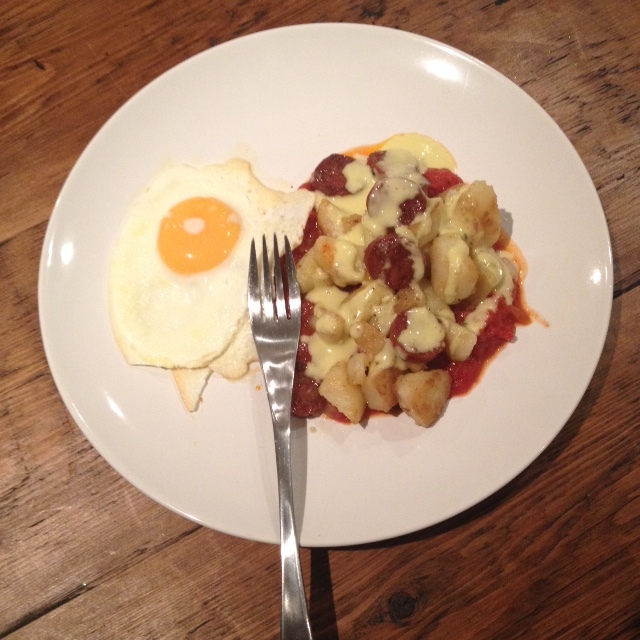 When I finished off the leftovers the next day I simply added a fried egg. Delicious! Peel the potatoes and cut into cubes. Par-boil in salted water until just softened, approx 5-7 minutes. Drain and fry in oil until golden brown and soft (or even better, deep fry until golden brown and soft in the middle). While the potatoes are cooking, make the sauces. Tomato sauce: Fry the pressed garlic in some oil in a non-stick sauce pan. Add the chopped tomatoes and tomato paste. Bring to the boil and cook until it has thickened. Season to taste with salt, pepper, chipotle paste and smoked paprika. Allioli: Mix the egg, sherry vinegar and garlic in a blender. Add 1 tsp oil and beat. Then add the rest of the oil in a trickle while beating. Add salt, pepper and maybe some lemon juice. Season the potatoes. Serve by smearing tomato sauce onto the plate/serving bowl. Add the potatoes and top with allioli.